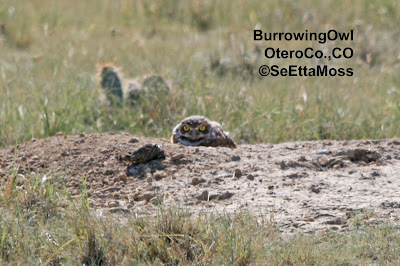 Late yesterday afternoon I drove through part of the Seep Springs unit of the BLM Gold Belt Area in Fremont Co,CO checking to see if the motorized use was staying on designated routes so as not to tear up the nice pinyon-juniper habitat, a small bird flew in front of my car. I stopped quickly and scanned the pinyon pines about 25 feet away until I spotted this adult male Black-throated Gray Warbler. 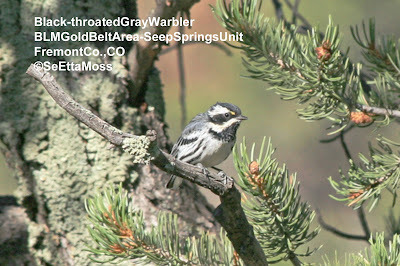 These warblers use mature pinyon-juniper habitat "almost exclusively" according to the Colo Breeding Bird Atlas I. 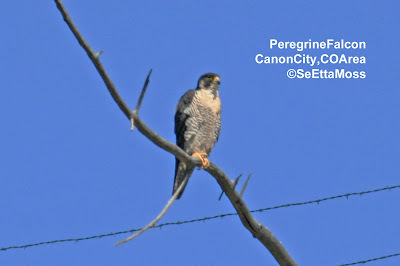 Since this small bird (only 5 inches long) was so far away relative to it's size, I had to push the cropping of these pics but they show it's field marks well--gray back and wings with 2 white bars, black crown, throat and eye stripe, white eyebrow and malar stripe, black streaks on sides with white underparts plus small yellow spot in front of eye--very distinctive male plumage. 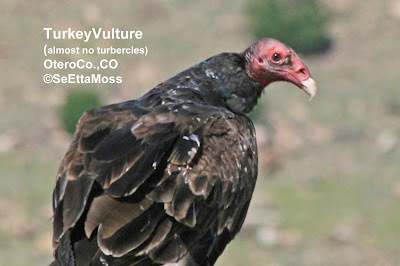 This Turkey Vulture was with a large group, most flying but a few others hanging out on a fence, in Otero County. 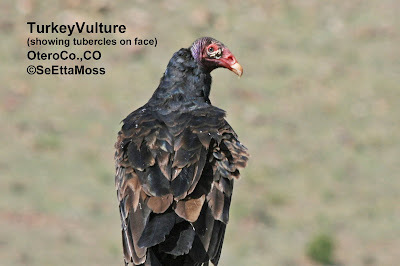 The top pic shows an adult Turkey Vulture with a moderate amount of white tubercles on it's face with "black hairlike feathers on lores surrounding the tubercles" as described in Raptors of Western North America. 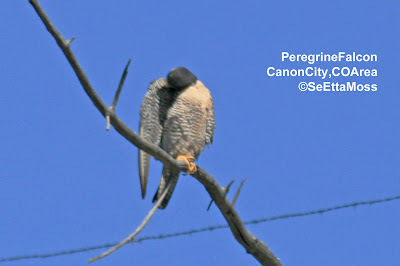 You can see the tubercles up close by double-clicking on the pic (tho the photo gets blurry it shows the features). The bottom pic is of the same bird but with it's nictitating membrane over it's eye.